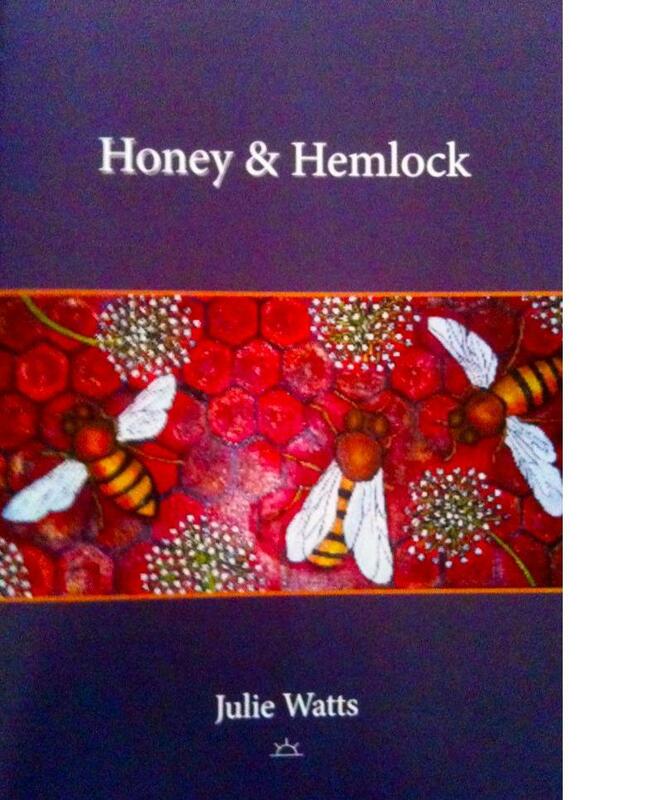 Honey & Hemlock by Julie Watts. Sunline Press, 2013. When I was lucky enough to have a stay at Tom Collins House in Perth I was told about the historical resentment that WA writers had about the exclusionary attitudes of “the scene” over east. Considerably lessened, they’d say, but still very real. I was surprised at this proposition in the age of comparatively cheap airfares and e-mails scuttling across the globe, but in the end I saw their point. Julie Watts was one of an array of dynamic, fascinating emerging poets whom I ran across during my stay. I was expecting good writing when I received her first book “Honey & Hemlock” but I got a hell of a lot more. Like many inaugural titles the subjects are heavily autobiographical ranging across lovers, parents, daughter, mishap, nursing home and pets. But given that familiarity of theme, the reader is even more enriched by the gift of her language… the way she makes enlivens these themes. “So Much Depends” finishes the book and I couldn’t extract a single word from this poem, the whole works so perfectly. Had I been allowed only to read six books this year, there would not be a moment of regret if this had been one of them. Any of us “eastern-staters” who may not have run across her or even Roland Leach’s Sunline Press are strongly encouraged to rectify the issue. This entry was posted in Honey & Hemlock, Issue 7, Julie Watts, Les Wicks, Sunline Press and tagged Australian Literature, Australian poetry, Tom Collins House by Mark Roberts. Bookmark the permalink. Julie is a humble person, so I am extra glad Les has spoken up for her and broadcast his assessment of her qualities. I second his opinion and urge you to purchase this collection. Looks good Mark, just wondereing why you changed the title to from welcomed to welcome? I blame the slack sub-editor! Title has been fixed and that sub-editor will never work in publishing again!